Glorious Greens – NYC, have you stopped to smell the myrtle today? So, design. When it’s good, it’s usually great – and when it’s bad, it’s usually “ugh, awful, no way!” This is true across the board – fashion, graphic design, food, flowers, you name it. Many people think that the trick to good design is “having a great concept” – those people aren’t wrong, but they’re missing the secret: a good design covers all the details. When it comes to flowers, one of the details we almost never hear customer’s mention is the Green Stuff. But any floral designer with an attention to detail knows better. Starbright’s designer’s are fully aware what a difference upscale greens can make in an elegant flower arrangement for NYC floral consumers. They may not be the star of the show, but these glorious greens can have a huge impact on the “vibe” of an arrangement. They are also a great way to personalize the standard Valentine’s Day fare of “a dozen roses”. Whether your looking to send something light and airy or lush and full – the greenery is a great place to make it your own. 1. Spiral Eucalyptus : These “dusty” green shoots are ideal for filling in lofty arrangements and adding height. 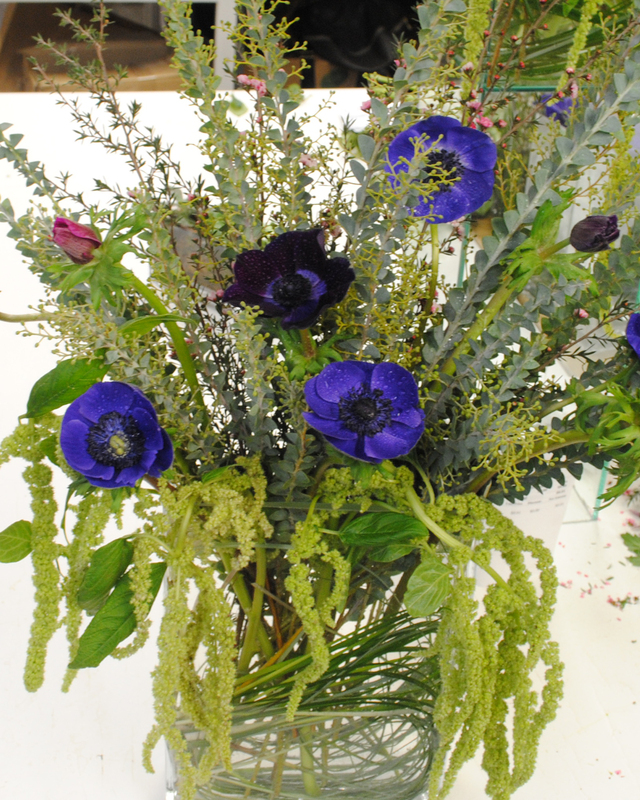 One of Starbright Floral Design’s favorite uses of seeded eucalyptus is with long-stem roses. This classic combination creates an airy elegance perfect for the minimalist in your life. 2. African Boxwood : Notable for it’s fine-toothed leaves and reddish tint, this green is a great compliment to all sorts of arrangements. The little, but lush clusters of leaves will fill in a lot of space and add a slightly “fresh-from-the-garden” feel to your arrangement. Boxwood has a long-vase life and will dry-out nicely as well. 3. Myrtle : This is another fantastic green to accompany your long-stem roses for Valentine’s Day. 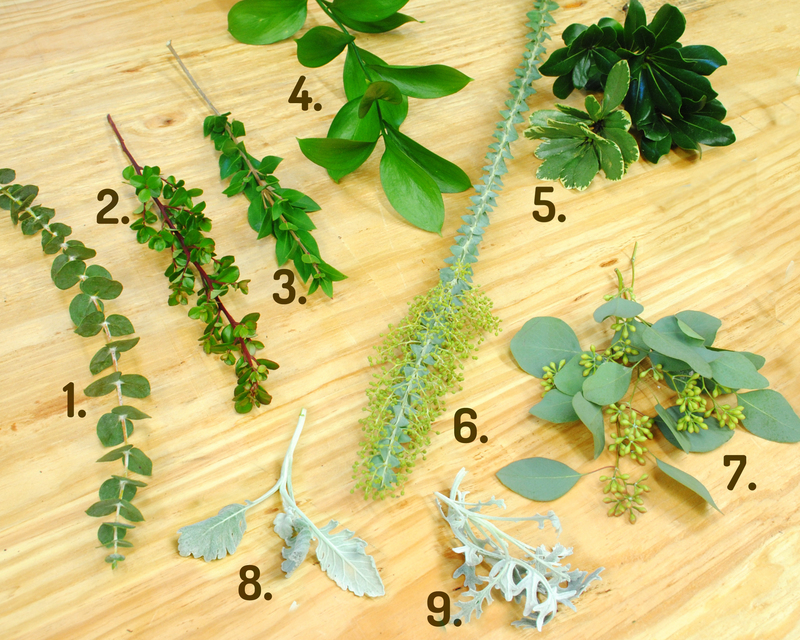 The bright jewel-green leaves and wood-like stems also have a sharp, clean smell and will stand up nicely in taller arrangements. In ancient Greco-Roman times, Myrtle was considered sacred to Venus, the goddess of love, and used to decorate wreaths and make garlands. 4. Italian Ruscus : Ruscus is an interesting addition to any arrangement. The large leaf-like cladodes are a brilliant green that matches the green stem; the tonal color makes these waxy greens look almost too perfect to be real. 5. Pittosporum : These are one of the more common greens that appear in short and mid-height arrangements. The plain leaves are bright green while the variegated variety is a softer shade of green with ivory details around the edges. But our favorite part about working with this green at Starbright Floral Design is the sweetly scented leaves. 7. Seeded Eucalyptus : This eucalyptus variety has a softer appearance than the spiral eucalyptus. The leaves of this variety are slightly larger and droop romantically around cluster of lighter, and brighter seeds. If you’re looking for something softer that could potentially be described as “dreamy” – this is the eucalyptus for you. 8. Broadleaf Dusty Miller : These leaves are prized for their uniquely sliver appearance and soft felt-like texture. Another “romantic” green, broadleaf dusty miller looks great in low arrangements where it’s short stems can get to water. 9. Lace Dusty Miller : Another variety of dusty miller, known as silver ragwort, which is perfect for adding extra romance to an arrangement. The leaves of this variety also have a soft felt-like feel and silvery color. Next time you call the shop and order some flowers, feel free to give us some hints about the whole arrangement. We want you to be 100% happy with your flower purchase – the best way for us to do that is to give you exactly what you want! 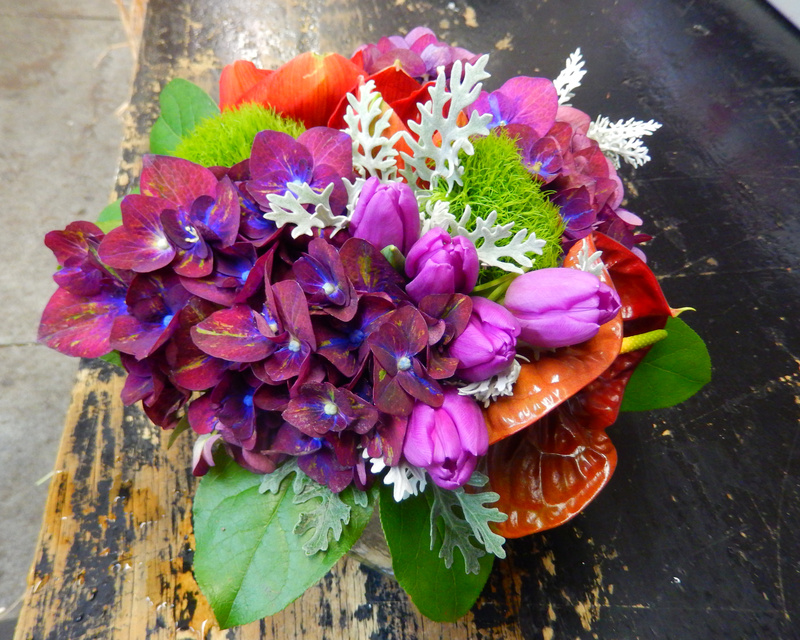 Author Starbright Floral Design of NYCPosted on January 21, 2015 Categories Color, Flowers and New York CIty, Flowers as Gifts, Plants, Romance, Stems and Bloom Varieties, Thoughts and IdeasTags Acacia, African Boxwood, dusty miller, Floral Arrangements, Greenery, Greens, Italian Ruscus, Myrtle, Pittosporum, seeded eucalyptus, unique floral designs1 Comment on Glorious Greens – NYC, have you stopped to smell the myrtle today?